After an eventful World Cup and preseason, the Premier League season is almost here. 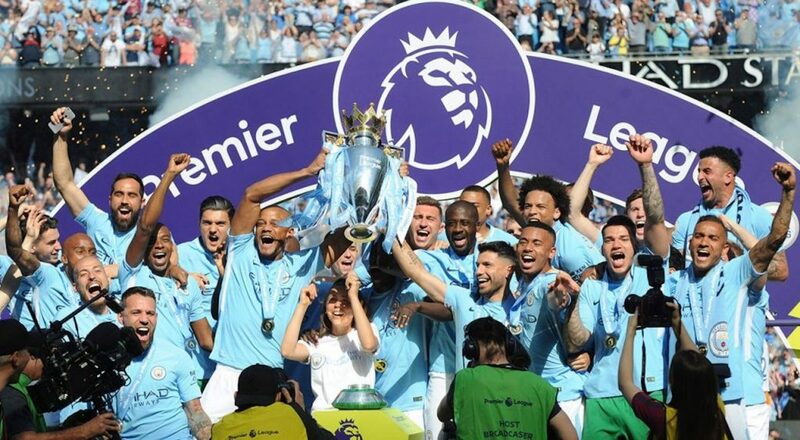 As Matchday One approaches, many teams in the Premier League are wrapping up transfers and new signings all with their eyes on the Premier League trophy. Each team hopes to start off strong in their first match, but with a 38 game season, anything can happen. Here are Prime Time’s picks for the upcoming 2018-19 Premier League season from our Editor-in-chief Kyle Bray and staff writer Cullen McIntyre. Manchester City dominated the league last year, topping the table with 100 points, 19 points over second place Manchester United. Under Pep Guardiola City has been an unstoppable force, with a blistering attack and solid defense. Adding Riyad Mahrez to an attack that scored 106 goals last season brings even more of a threat. If City can continue to dominate, first place is all theirs. Manchester City was by far the best team in the Premier League last season by a long shot. Pep Guardiola’s system finally clicked and his team was simply unstoppable. While they’ve only made one big signing this offseason in Riyad Mahrez, the important thing is they didn’t lose any of their key players that helped them walk the league last season, which means Manchester City has only improved this offseason. Expect Manchester City to dominate the Premier League this year. Having finished fourth last season, and making it to the Champions League final, Jürgen Klopp’s Liverpool will be an exciting team to watch this year. Mohamed Salah’s 32 goals in 38 games is a Premier League record, and with Roberto Firmino and Sadio Mane, Liverpool’s attack will be scoring plenty of goals this season. Bringing in Alisson, Naby Keita, and Fabinho will strengthen a midfield and defense that desperately needs it. Bringing in Swiss international Xherdan Shaqiri adds depth to their lethal attack. Liverpool should look forward to an exciting season in the Premier League. While Liverpool fell short in the Champions League final last season, don’t expect that defeat to effect their upcoming season. After many solid summer additions, Jurgen Klopp’s Liverpool side has one of the best all-around teams in the league, with great depth at each position. Alisson gives Liverpool great experience at the keeper position—something they’ve lacked for a long time. Fabinho and Naby Keita will solidify Liverpool’s midfield and Xherdan Shaqiri—while he may not start—is a great value addition who will provide depth down the stretch. While they won’t beat Manchester City for the title, Liverpool certainly is their biggest threat. After an abysmal sixth-place finish last year and barely qualifying for the Europa League for the second season in a row, Arsenal needed change. So far, it looks like new manager Unai Emery has done exactly that. A new 4-3-3 formation and a new look Arsenal side have given fans plenty of reasons to be excited about this year. Bernd Leno, Stephan Lichtsteiner, Sokratis, and Lucas Torreria all bring quality and depth to a weak Arsenal defense. Arsenal’s strike partnership of Pierre-Emerick Aubameyang and Alexandre Lacazette will be a threat to every defense they face, with Mesut Özil providing plenty of chances. Arsenal will have no problem qualifying for the Champions League for the first time in three years with a top-four finish this season. While their title challenge fell short yet again, Tottenham Hotspur still had a great season last year. Star striker Harry Kane went neck and neck with Liverpool’s Mohammed Salah for the golden boot and players like Dele Alli, Christian Eriksen, and Son Heung-Min all enjoyed solid seasons. While Tottenham hasn’t made any signings this offseason, they still possess one of the strongest and most versatile teams in the league. Without losing any key players over the summer transfer window and Hugo Lloris winning his first World Cup, expect more of the same from Spurs. A quality third-place finish in last years Premier League saw the North London club show off their strengths. Tottenham has been on the rise the past couple seasons, with Harry Kane tearing the league apart every year scoring 25+ goals per season since 2015/16. Delle Alli has been outstanding every year, and a solid back line in Belgium pair Toby Alderweireld and Jan Vertonghen brings trouble for any Premier League side. Though no signings this summer may show lack of ambition by manager Mauricio Pochettino, the Spurs still have a quality team that will bring continental qualification with a top-six finish this season. This offseason has been an eventful one for Manchester United, to say the least. Their only notable addition this summer transfer window was Fred from Shakhtar Donetsk and manager Jose Mourinho constantly is in the news lamenting his team’s failed attempts to bring in top-tier players—most recently Atlético Madrid’s Diego Godín turned down a switch to the club. However, Manchester United still finished second last year and was overshadowed by a Manchester City team that is considered to be the greatest the league has ever seen. Manchester United are by no means a bad team and still have one of the best rosters in the world. While many think they’ll suffer under Mourinho’s curse of the third season, Manchester United will be just fine. With Watford losing start man Richarlison, Huddersfield lacking quality in attack, and Cardiff City having the weakest side in the Premier League, these teams will be lucky to make it out of relegation. Each side has made additions, but none that will push them to a mid-table finish. Watford has the best chance of the three to make it out of the relegation zone, with clubs like Brighton and Burnley all having chances at finishing in the bottom three. Now for the bottom. Welsh side Cardiff City still have an EFL Championship level squad, so that’s exactly where they’ll be heading after this season in the Premier League. With fellow newcomers Fulham and Wolverhampton Wanderers showing more ambition, Cardiff will get left behind and drop down to the Championship. Southampton barely survived the drop last season and has failed to add any real quality to their team this offseason other than defender Jannik Vestergaard, so don’t expect much from them this year. Brighton has also had a subpar transfer window and will most likely not survive their sophomore season. Having won the Championship playoff to return to the Premier League for the first time since the 2013/14 season, Fulham has made brilliant signings in the transfer window, bringing in World Cup winner Andre Schurrle from Dortmund, and snagging Barcelona and Chelsea transfer target Jean Michael Seri. With young star Ryan Sessegnon proving his worth in the Championship, he will look to continue his impress at the top-level. Playing a beautiful and attacking style like Manchester City, Fulham will surprise many this year. Do you agree with our picks? Leave yours in the comments below!